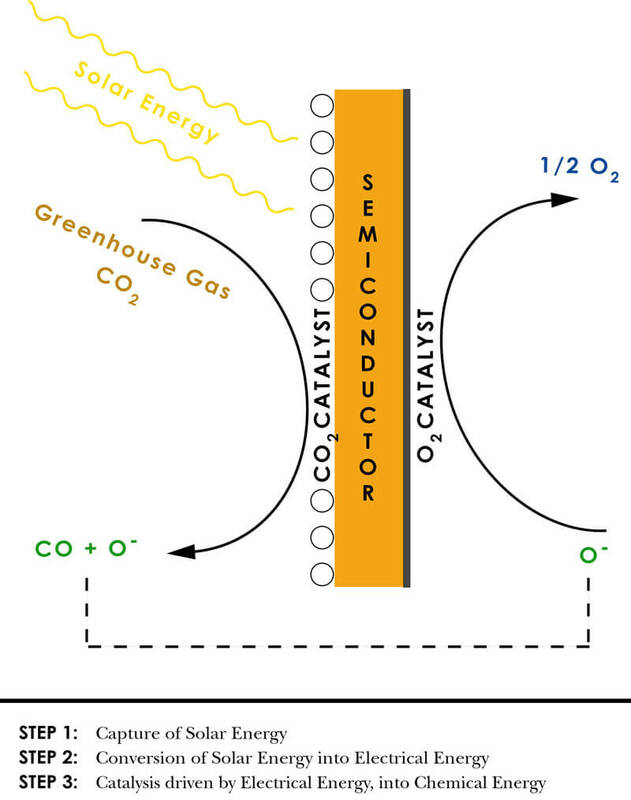 Chemists at the University of California, San Diego have demonstrated the feasibility of exploiting sunlight to transform a greenhouse gas into a useful product. Many Earth Week activities will draw attention to the increasing concentration of carbon dioxide in the atmosphere and the resulting impact on global climate. Now Clifford Kubiak, professor of chemistry and biochemistry, and his graduate student Aaron Sathrum have developed a prototype device that can capture energy from the sun, convert it to electrical energy and “split” carbon dioxide into carbon monoxide (CO) and oxygen. Because their device is not yet optimized, they still need to input additional energy for the process to work. However, they hope that their results, which they presented at last month’s meeting of the American Chemical Society, will draw attention to the promise of the approach. Although carbon monoxide is poisonous, it is highly sought after. Millions of pounds of it are used each year to manufacture chemicals including detergents and plastics. It can also be converted into liquid fuel. 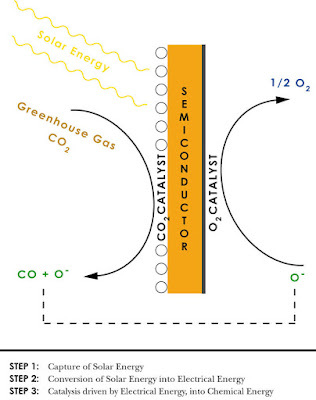 The device designed by Kubiak and Sathrum to split carbon dioxide utilizes a semiconductor and two thin layers of catalysts. It splits carbon dioxide to generate carbon monoxide and oxygen in a three-step process. The first step is the capture of solar energy photons by the semiconductor. The second step is the conversion of optical energy into electrical energy by the semiconductor. The third step is the deployment of electrical energy to the catalysts. The catalysts convert carbon dioxide to carbon monoxide on one side of the device and to oxygen on the other side. Because electrons are passed around in these reactions, a special type of catalyst that can convert electrical energy to chemical energy is required Researchers in Kubiak’s laboratory have created a large molecule with three nickel atoms at its heart that has proven to be an effective catalyst for this process. Choosing the right semiconductor is also critical to making carbon dioxide splitting practical say the researchers. Semiconductors have bands of energy to which electrons are confined. Sunlight causes the electrons to leap from one band to the next creating an electrical energy potential The energy difference between the bands—the band gap—determines how much solar energy will be absorbed and how much electrical energy is generated. Kubiak and Sathrum initially used a silicon semiconductor to test the merits of their device because silicon is well-studied. However, silicon absorbs in the infrared range and the researchers say it is “too wimpy” to supply enough energy. The conversion of sunlight by silicon supplied about half of the energy needed to split carbon dioxide, and the reaction worked if the researchers supplied the other half of the energy needed. They are now building the device using a gallium-phosphide semiconductor. 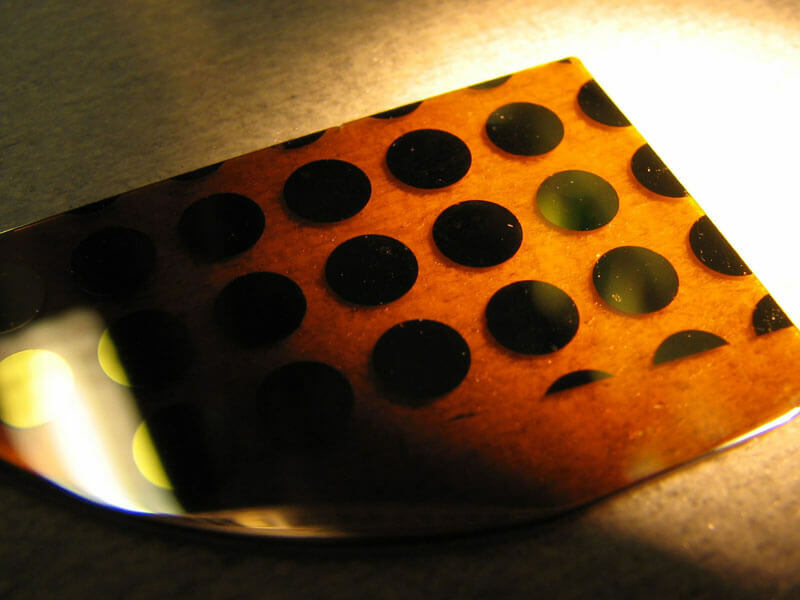 It has twice the band gap of silicon and absorbs more energetic visible light. Therefore, they predict that it will absorb the optimal amount of energy from the sun to drive the catalytic splitting of carbon dioxide. The research is supported by the Department of Energy.